Banish the thought that self-care is selfish. See, it’s not always about allowing yourself to enjoy costly pleasures. Ultimately, it’s about feeling good and connected to your body. Working with a budget? 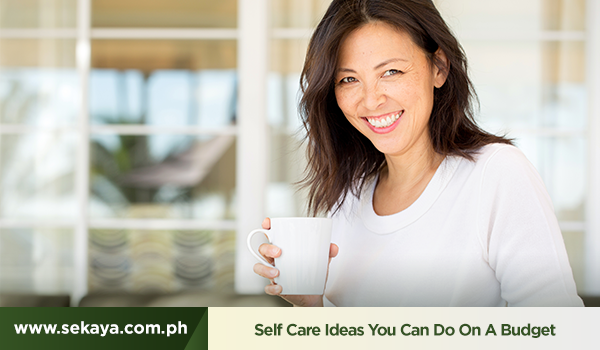 Here are a few self-care ideas you might want to try. A visit to the spa, an out-of-town trip—often, we look at the costly ways of unwinding and treating ourselves. But really, the idea of self-care is more about keeping your mind and body wellness in check than the methods with which you attempt to achieve a more complete and collected you. The simple, everyday habits can be as rewarding experiences too, especially when you try to be intentional about them. A research from Princeton University found that physical activity reorganizes the brain in a way that it reduces or controls our reaction to stress. When walking, your mind is forced to focus on the basic thoughts and movements of putting one foot in front of the other, taking in what’s happening around you,and the visual image of where it is that you are headed to. Taking a shower has become one of those daily habits that we regularly take for granted. Instead of treating it like a chore, make it an everyday rewarding experience to look forward to. Close your eyes, maybe even sing a song while feeling the refreshing, relaxing water of the shower pour down every corner of your body. Didyou know that cold showers have been found to improve immunity, optimize bloodcirculation, and speed up muscle recovery? Find a comfortable spot on the floor,close your eyes and make no effort in controlling your breath. Clear your mind of any thoughts and just be present. Stop doing and just be. If you would like more guidance in doing the practice, you can opt to meditate with free mobile apps such as Calm or Headspace. Whenevents don’t go according to plan, it can be frustrating. But in such situations,you can minimize stress and anxiety by accepting that some things are beyond your control. Sometimes, you just have to accept things and go with the flow. Sign off from social media from time to time. Take a break from the toxic negativity online, and choose to be in the loving company of friends and family. Plan a weekend hangout, or a serene, restful slumber party with Cozy Calm. Find more ways to ensure overall mind and body wellness with nature’s healing and empowering gifts in every Sekaya botanic infusion.